Scholar of the second century C.E. Like Todos (Theodorus) the Roman, his probable contemporary, Platon sought to inspire his persecuted coreligionists with resignation and steadfastness, reminding them that others had suffered before them for their faith and had been ultimately delivered. "Hananiah, Mishael, and Azariah," said he, "derived courage to resist Nebuchadnezzar, at the risk of being burned" (Dan. iii. 13), from the Scriptural assurance (Deut. iv. 29), "If from thence thou shalt seek the Lord thy God, thou shalt find him, if thou seek him with all thy heart and with all thy soul" (Midr. Teh. xxviii. 1). 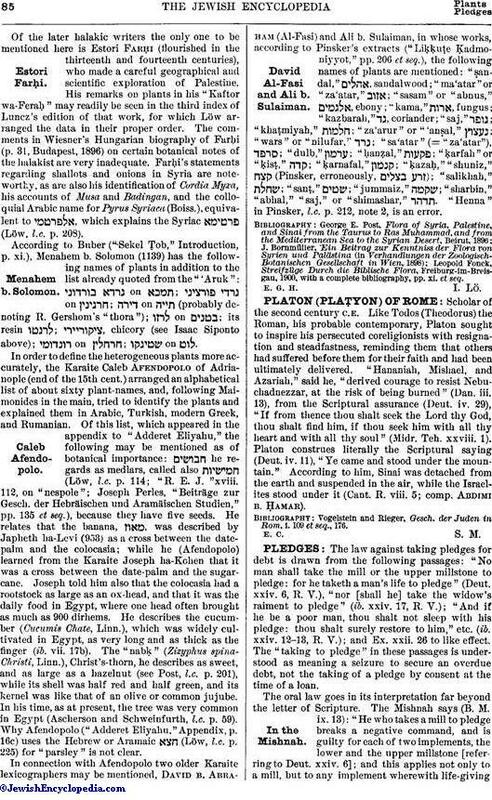 Platon construes literally the Scriptural saying (Deut. iv. 11), "Ye came and stood under the mountain." According to him, Sinai was detached from the earth and suspended in the air, while the Israelites stood under it (Cant. R. viii. 5; comp. Abdimi b. Ḥamar). Vogelstein and Rieger, Gesch. der Juden in Rom, i. 109 et seq., 176.